An inspirational drama, "Akeelah and the Bee" is the story of Akeelah Anderson (Keke Palmer), a precocious eleven-year-old girl from south Los Angeles with a gift for words. Despite the objections of her mother Tanya (Angela Bassett), Akeelah enters various spelling contests, for which she is tutored by the forthright Dr. Larabee (Laurence Fishburne); her principal Mr. Welch (Curtis Armstrong) and the proud residents of her neighborhood. 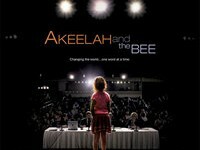 Akeelah's aptitude earns her an opportunity to compete for a spot in the Scripps National Spelling Bee and in turn unites her neighborhood who witness the courage and inspiration of one amazing little girl.